If you're looking for top toys for 4 year old boys, there are lots of ideas below. They are based on toys that my sons loved to play with at age 4. My eldest son is now 8 but my youngest son is currently 4 at the time of writing. They include presents that they received for their birthdays and the toys that they loved to play with most. Ideas include outdoor toys, construction toys, imaginative toys, educational toys, cars, trucks and games. 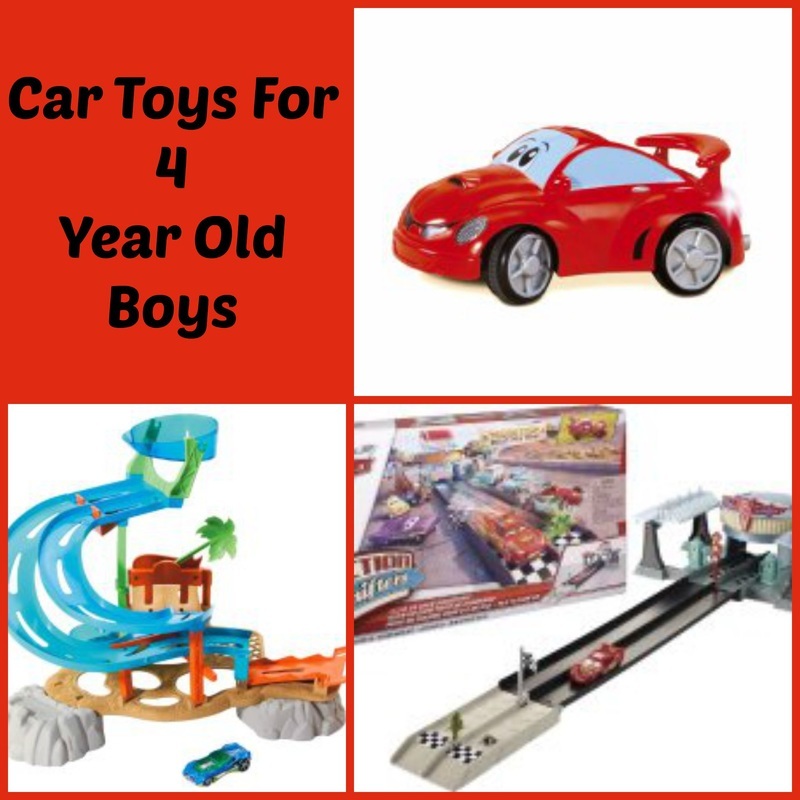 Read on for lots of ideas of the best toys for 4 year old boys. My youngest son Callum in his new supehero pyjamas on his 4th birthday. There are lots of great construction toy for 4 year old boys. My eldest son loves marble runs and lego but there are some other great themed construction toys that I know he would have loved too! Check out some ideas and more details below. Marble runs are great toys. At aget 4, my eldest son would spend ages building them up and then running marbles down them. And (speaking from experience) they are great fun for adults to play with too. The Galt super marble run featured is a good choice. It's sturdy and the pieces slot together well. It includes 9 chutes, 9 curves, 24 tubes, 6 bases. 4 year olds can start buy constructing simple marble runs and then progress onto more complicated structures. My 4 year old has a big tub of lego and he will spend over an hour building (normally cars, space rockets, monsters and aliens!). The are lots of lego sets which make good starter kits and are aimed at ages 4 plus. One of the best lego sets for this age is the Juniors easy to build set aimed at kids aged 4 to 7. The sets are designed to be easy to build for young children. There are superhero themed junior kits like the lego juniors batman kit featured. For more options on lego see my page on lego for 4 year olds. Outdoor toys are great fun to burn off lots of energy. 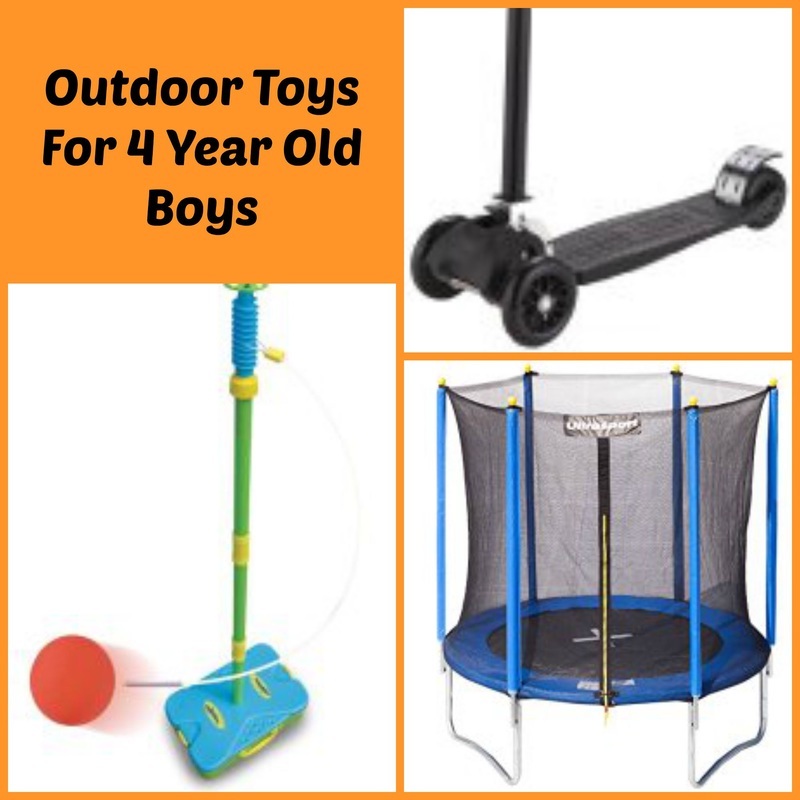 There are tons of great outdoor toys for this age group. Ideas include trampolines, scooters and balance bikes. Kids this age love gardening and using wheelbarrows and watering cans and there are some fab toy gardening sets. There some great outdoor games sets such as outdoor bowling, football goals and hoopla. And don't forget the traditional Summer toys such as swings and slides. Check out a couple of my top picks of outdoor toys below. Stomp Rocket - Best Outdoor Toy! This has to be one of the best toys for kids of all ages and 4 year old boys are no exception. Both my boys enjoy having a go at this. Stomp on the pump at the bottom of the stomp rocket and see how high you can shoot it into the air. The last time we took our stomp rocket to the park, we had an audience of kids who kept running to get the stomp rockets for us and wanted to have a go. A scooter has got to be one of my best purchases ever for my eldest. We have used a scooter almost everyday to go to and from school, from when he was 4 until today! He scoots about on it for fun too. We bought our son the lightening strike two wheeled scooter for my eldest son's 4th birthday and he was fine using the 2 wheel scooter. It folds up which was great when he became tired I could carry it easily. It also has flashing lights which he loves. If you're looking for a scooter, you may appreciate this article on the best scooters for 4 year olds. 4 year old boys imagination is on fire, so any toys that facilitate imaginative play are really good gift ideas. Dressing up clothes, action figures, superhero toys, tool kits, medical kits, puppets and puppet show theatres all can make good ideas. My youngest loves pretending to be a doctor. Check out this review of the best doctor kit ever. Another great idea is a cash register or till. We have one and my son loves playing shop. It's also great for teaching about money and learning numbers too. They may also like toys inspired by TV shows and movies that they have watched. 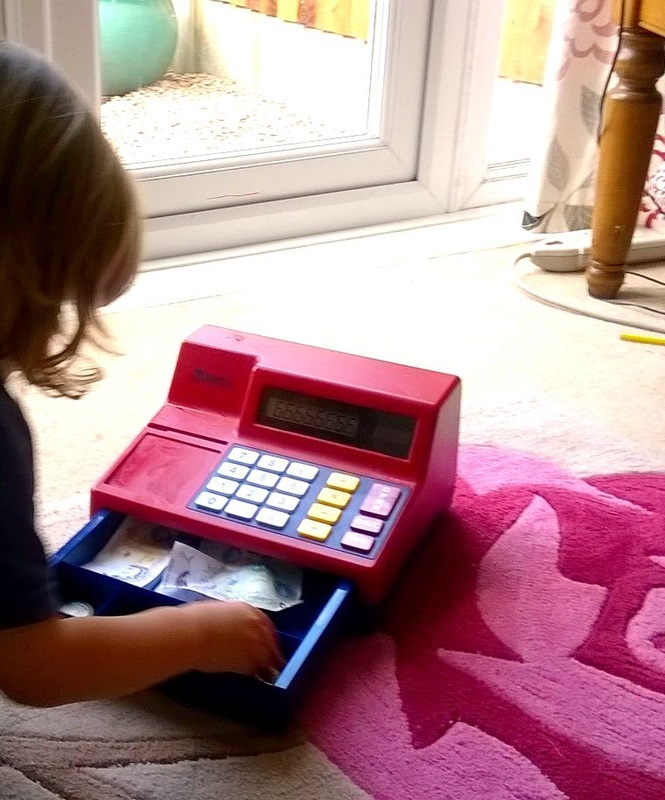 My 4 year old playing with his cash register. For example, my youngest boy loves the movie Disney Pixar Cars and will spend ages with his cars who talk to each other and have adventures. Other boys this age like TV programmes including Octonauts, Bob the Builder and Fireman Sam. This toy is on our wanted list. Remote control cars are great toys for 4 year old boys. The car opposite has a remote control with an easy grip controller which is perfect for little hands. There are fun sounds with a button to activate barking sounds. He can switch on the working headlights too. You can also use the controller to perform super-cool donut spins. Check out lots more car themed toys for car mad kids. My eldest son received the pretend post office for his 4th birthday which he loved. The items that come with the post office are small but there are forms to fill in, cards to put in envelopes,stamps and a post box to post letters which has really kept my son occupied. He loved playing post office, stamping and "writing"! I supplemented it with some 1p stamps from the royal mail. 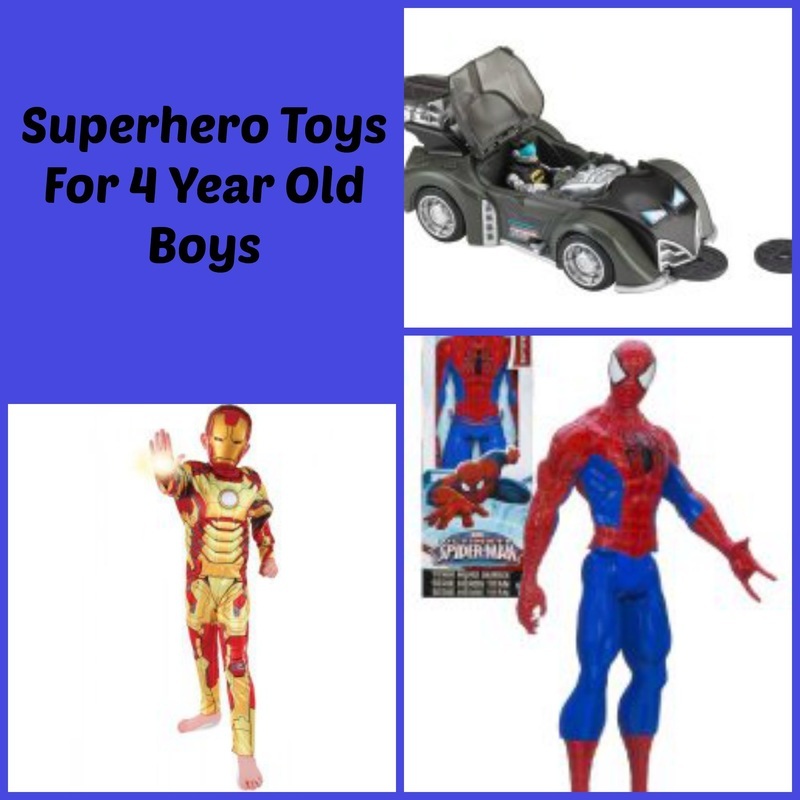 Many 4 year old boys like superheros including batman, spiderman, ironman and more. My eldest son loved cars and construction toys the most but my youngest son and one of my nephews who is also 4 are both superhero mad. The lego junior kits featured above make some good superhero themed gifts. But there are lots more superhero themed toys that many 4 year olds will love. They include superhero themed playsets, figurines, dressing up sets (such as batman, spiderman, ironman and The Hulk), books, arts and craft sets and lots more. Check out the superhero toys for 4 year olds page which has lots of ideas that my youngest boys loves including the imaginext batcave playset. Also check out the batmobile below. I bought my nephew a barcave for his 4th birthday. He loves superheros and imaginative play so I couldn't go wrong. His Mum said he loved it - so if you know a similar 4 year old boy they might like a the Fisher Price Imaginext batcave like the one featured. Thegreat thing about imaginext set is that they are high quality, sturdy toys that withstand the play from little kids. The set opposite is perfect for imaginative play. There are lots of great educational toys for 4 year old boys. Jigsaws and toys which teach letters and writing are good choices. Also books make great gifts and are great for improving the vocabulary range of young children. Check out some toy ideas below. Melissa and Doug see and spell is another good choice. You complete simple puzzles to spell words. Great for letter recognition and learning simple spelling. My 4 year old has this toy and he completes it on his own or sometimes we used to have races to see who could complete the most word jigsaws the quickest. 4 year old boys are now old enough to play simple board games and if they are anything like my son they will love playing family games. One of the best range of board games for this age group are made by orchard toys. They have a huge range of simple games that kids this age love. We have played lots of Orchard toy games and you can read more about them and other board games in this article on board games for 4 year olds. They are very educational and my son loves them. . Check out the reviews on amazon.co.uk - they're really good. My son particularly loves the greedy gorilla game featured opposite. Its a simple board game which teaches about healthy eating and the kids love it when the gorilla burps if you put a card with junk food in him. 4 year old boys still love playing with cars, trucks and vehicles. Some good gift ideas include remote control cars or a big set of toy cars such as hot wheels cars. Another idea is a toy car transporter. My son will spend ages driving his cars on and off his car transporter. He also loves the Disney Pixar Cars movie and has many of the toy car characters from the movie including Lightning Mcqueen and Matar. He has a Mack which carries all the Disney pixar cars and loves to put the cars in and out of Mack. Car play sets such as hot wheels tracks are another cool toy for 4 year old boys. The hot wheels track set features a movable launcher, pop-up dragon and multi-levels. It comes with a hot wheels car. The Hot Wheels builder tracks are also worth looking at. You can connect and disconnect the track to build the track that you want, so as well as race cars it's a bit of a building toy too. It also allows kids to race cars side by side down the big ramp. It comes with one car. My son loves lego so much we thought we would try out some more great construction toys. Here are some ideas. They are extremely good value for money. There are also a couple more construction toy ideas for you to consider. Kid K'nex was another favourite construction toy that my eldest son received for his 4th birthday. He would spend ages building different creatures and monsters and playing with them afterwards. They also had kid knex at my son's preschool and he loved playing with them there too. Another really cool construction toy is the gears, gears, gears opposite. What sets this apart from lego and other construction toys is that you build things and you can move the parts too. So you can build a caterpillar which moves, a robot - or whatever their imagination conjurs up. The set opposite includes a storage box overflowing with gears, cranks, connectors and interconnecting base plates. Here are a few more great toy ideas for 4 year old boys. My 4 year old loves taking pictures and one of the presents he got for Christmas from his grandparents was the blue Vtech Kidizoom Camera opposite. He loved to take photos with it. Its great fun to use and really creative. Its really interesting to see what little kids take photos of as well. You can take funny pictures and make people different creatures or look like they're wearing different props like hats. It also has simple games that he loves to play and keep him occupied for a while. And you can use it to shoot video. It has a front and back lens so they can even use the cameras to take selfies. Please note - He has now broken his Vtech camera which he loved after dropping it in water - be warned they aren't completely indestructable!! My son loves making drawing, gluing, painting and making things at the moment. 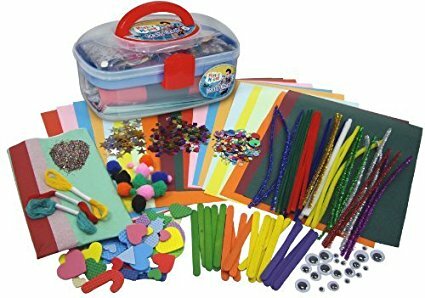 He received the Mr Maker arts and crafts set for last Christmas and had so much fun with it. It comes with toys you can make with the contents. However, I just laid out all the craft items on the table and let him make what he wanted which seemed to work better for him and me. If you're looking for stocking filler ideas for a 4 year old boy, here are a few suggestions based on what I'm putting in my 4 year old boy's stocking this Christmas. I'm putting in a small Lightning Mcqueen lego toy for him to build. He loves the Mr Men so I'm putting in a pack of Mr Men play cards. You can use these to play pairs, snap, happy families etc. There are lots of cards like this, so you could choose a theme with whatever your little one likes (Octonauts, Toy Story, Cars etc). Crayons, pencils and pens are good stocking fillers for my 4 year old. He loves drawing and colouring so I know they'll be used. Glow in the dark stars would also make a good stocking filler. My 4 year old already has these and stuck them on his ceiling but they would make a nice stocking gift if he didn't have them. There are lots more toy ideas to keep children occupied throughout the site. There are also suggestions and advice on buying jigsaw puzzles, outdoor toys and books too.